Edgewood now offers paddle tennis. Family: “Family” includes all members of the family under the age of 21 living at the same address. 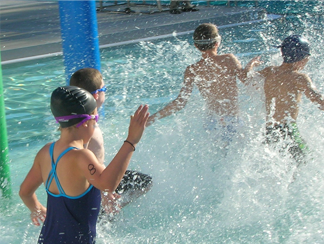 Children under the age of 12 much are accompanied by an adult or paddle professional. Couple: Two individuals residing at the same address. Daily Fee/Guest: Edgewood guest passes cannot be used for paddle tennis. They are considered “Daily Fee” players. Individuals who begin playing on a daily fee basis and later opt for the season pass can apply previously paid fees to the membership. Season Court Fee: If a group would like to reserve a particular court at a specific time every week for the season there is a $100 fee. This is per court and must be paid at the time of reservation. Registration: ALL PLAYERS reserve their court call the FRONT DEST at (203)528-0231. A Member may reserve a court 7 days in advance, a non-member may reserve a court 48 hours in advance. A court can be reserved for up to ninety (90) minutes and may not be part of consecutive reservations on the same court (unless approved by the head paddle professional). All reservations must be canceled 24 hours in advance to avoid a $25 fee. Shoes: Players must wear tennis shoes while using the paddle tennis courts in order to protect the court surface. Clothing: Athletic apparel of any kind and casual clothing (including “dress denim jeans”) are permitted at the paddle tennis facility. “Dress denim jeans” is what is acceptable for “business casual attire” and free from rips, tears and frayed edges. Cell phones and other portable communication devices: The paddle courts are a designated cell phone area. Please be courteous to your fellow members. Snow: EBT is a small facility without a full-time maintenance staff. We will do our best to have the courts cleared before any scheduled play. Support by the membership with snow clearing would be appreciated. Heaters: The heaters are for drying the courts only, not for snow removal or keeping the players warm. Accumulated snow must be removed before turning on the court or deck heaters. Please ask the desk for assistance with the heaters. Paddle Professional: Equipment, clinics, private lessons and an introduction to paddle tennis are through EBT’s head paddle tennis professional, Rob Howard, (203)482-4270 or email rhoward@post.edu or by calling the front desk. Non-Staffed Hours: Access to the paddle tennis courts during non-staffed hours may be arranged through the head paddle tennis professional or the desk. Equipment: There will be the ability to purchase equipment at EBT. There will be a limited supply of paddles to demo. All paddle returned damaged will incur a fee. Abide by all APTA rules with the highest regard for conduct – respecting line calls, avoiding foot faults, and never stacking courts to gain an advantage. Above from the Official Rule of Platform Tennis. With notes, comments, appendices and addenda, Seventh Edition, September 2010. Here are our fees - included in Edgewood Annual Memberships.